This has been such a good experience for me this month. I’ve been busy with work and other obligations, and had all the usual stress that entails, plus I’ve had my moments of getting frustrated with my restricted diet and a day where I didn’t feel very good. It would have been easy to get sucked into negative thinking, but the reminder that I’d committed to post something for which I was grateful forced me to reverse my thinking and look for the positive. Day 8: Today I am extra grateful for all the people who do the so called “dirty” jobs of society – nurses and nurse’s aides, garbage collectors, transit workers, custodians, and so on. These are the people who do the physical labor, the unpleasant tasks, the messy work that keeps us safe and healthy and make our modern world possible. Thank you! Day 9: I am grateful for friends, both near and far, old and new. Day 10: I’m grateful for the roof over my head. It might not be fancy or particularly large or exactly our “dream home” but it is safe and comfortable and it is ours, and that is much more than a lot of people in the world can say. Day 11: Especially on Veteran’s Day, but also every day, I am grateful for the men and women of our country who have served both in war and peace time to insure our safety and security. 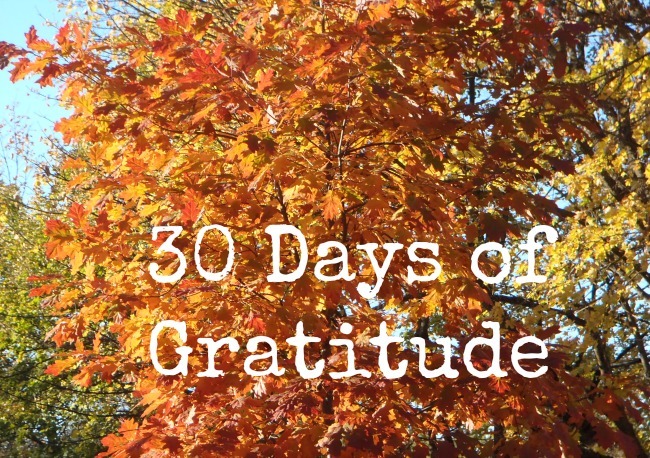 Day 12: I am grateful that I get to practice and teach yoga. It keeps me grounded and flexible, both physically and mentally. Day 13: I’m grateful for ginger tea! I had an upset tummy today and it made me feel so much better! Day 14: On my morning walk with the dog today I was particularly grateful for my down coat, warm hat, and thermal gloves… It’s cold out there, but I’m not going to complain because I have so much to be grateful for.